When the crowd roars, turn around and look behind you for some awesome photos. 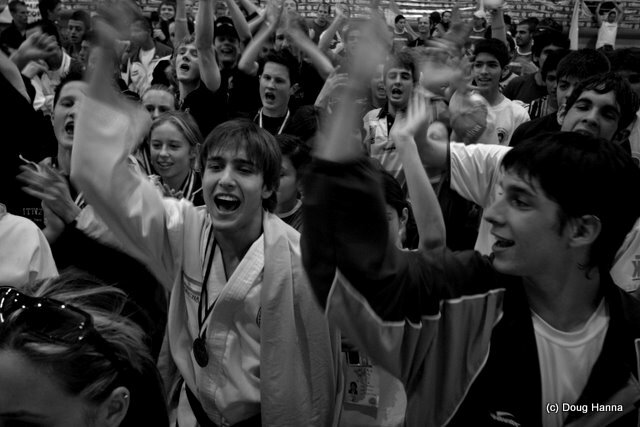 This image was taken at the end of the 2006 Junior World champs in Honduras and I think from memory that they are cheering for medal winners on the podium. Argentinians in white and Kiwis in black. To take this image I had on a wide angle zoom lens set almost fully wide, ie 22.0mm. I turned around during the ceremony and held the camera high up in the air at arms length and fired off a few shots. You have to point your camera a lot more downward than what feels right. Hold the shutter button half down for a second to give your camera a chance to auto-focus then let it roll of 5-10 shots in order to get a good one out of them. A slow shutter speed, eg 1/50th of a second adds motion as I've captured here.